Main month photographs. Each month's photograph is about 9-10 inches wide and has a detailed description. Photographs used in the 15 page Historical Essay. The 2009 calendar also includes approximately 30 additional inset photos that are shown on the main calendar pages (not shown here). The inset images supplement the main month photographs. The calendar contains over 90 photos related to the 1909 and 1912 celebrations. the Clinton County Historical Association in Plattsburgh, New York or the author. Manuscripts courtesy Special Collections, Feinberg Library, Plattsburgh State University College. No one has written a comprehensive history of the building of the two Samuel de Champlain Memorials in New York State until now. The original correspondence between the architects, Tercentenary Commissioners and the Ambassador of France have been used to build a timeline of events from 1906 to 1914. 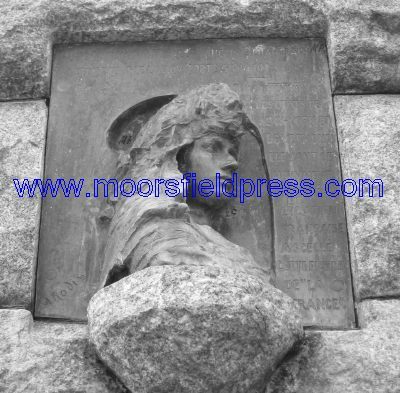 The correspondence has revealed the many changes that were made to the design of both memorials. Considerable correspondence between French Ambassador Jusserand and the architects also reveal the uncertainty of obtaining a Rodin bust as well as the type of bust that would finally be donated in the name of France. Although this is written in a calendar format for 2009, the publication contains a 15 page historical essay in the back of the calendar, very detailed monthly descriptions for 13 large format images (as well as inset photographs for a total of about 95 photos) and key dates related to the building of the memorials. This is more than just a calendar. In fact, the director of the Crown Point Historic Site calls it a "big, new and heavily-illustrated booklet (containing a tiny 2009 calendar) on the Champlain monuments at Crown Point and Plattsburgh." A snippet of what is written in the historical essay. There is considerably more written for each section. The Lake Champlain region had two celebrations related to the Tercentenary Celebrations of 1909. In July of 1909, the first Tercentenary celebration was held to commemorate the exploration of Lake Champlain by Samuel de Champlain three hundred years earlier. Celebrations on both sides of the lake included events at Crown Point, Plattsburgh and many other towns in the area over a one week period. During the 1909 celebrations, no Champlain memorials existed on the shores of Lake Champlain. The only statue of Champlain in the United States was at St. Mary’s Church in Champlain, New York, and this was dedicated on July 4, 1907. The New York and Vermont Tercentenary commissions resolved to build a memorial to Champlain as early as 1907 but several years of planning still needed to be done. It was not until 1910 and 1911, respectively, that the Champlain monument sites at Crown Point and Plattsburgh were selected and money appropriated. 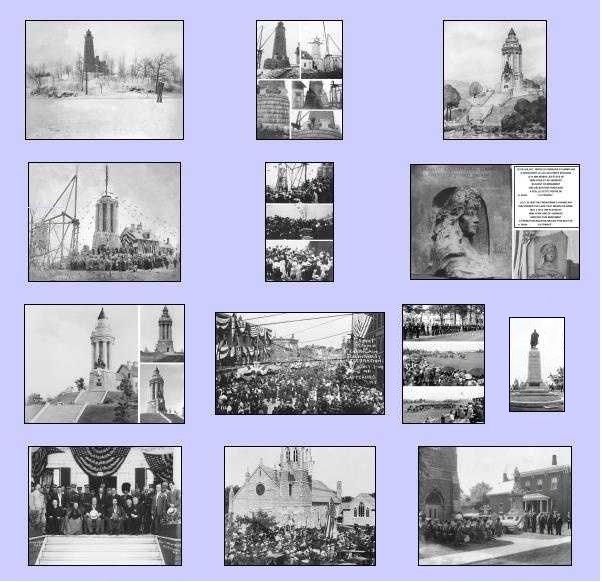 It took another year to build the monuments and they were dedicated in 1912 on July 5 and 6, respectively. This historic essay will focus on the design and building of the Crown Point and Plattsburgh Champlain Memorials. Much of what is written in the Tercentenary Final Reports of 1909 and 1913 is a literal transcription of the programs and speeches that occurred. In this essay, a behind-the-scenes look will explain the reasoning behind the selection of the two sites, the different designs contemplated for the monuments and the correspondence between architect Hugh McLellan and French Ambassador Jean Jusserand concerning the Rodin bust “La France”. 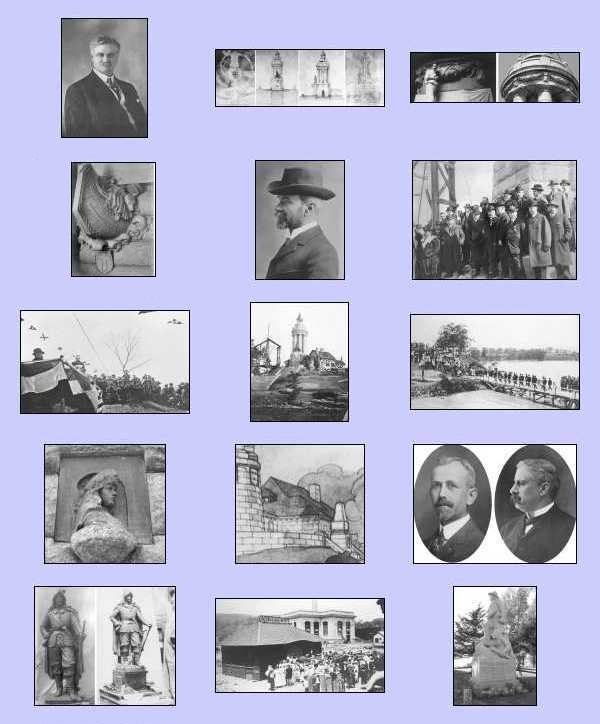 Although this calendar and historic essay is written for the Quadricentennial (400th anniversary) celebrations of 2009 and shows photographs from the 1909 celebrations, many of the events described here occurred well after 1909. The restoration and rededication of the Crown Point and Plattsburgh memorials, however, will be a significant part of the Quad celebrations starting in late 2008 and lasting throughout 2009. So it is only fitting that a history of the monuments be presented now for 2009 as well as a summary of the Champlain celebrations of 1909, 1912 and 1959. In November of 1906, Vermont took the first step and voted to appoint a commission to celebrate the 300th anniversary of the exploration of Lake Champlain. Vermont governor Fletcher D. Proctor asked New York Senator Henry W. Hill (a future NYS Tercentenary commissioner) to introduce a similar resolution in the New York State legislature. On April 15, 1907, five months later, New York State formed a similar commission. Its first task was to come up with a set of resolutions and this was agreed upon on December 21. It was resolved that the State of New York, with the help of Vermont, would build a permanent memorial someplace in the Champlain Valley and that money would be appropriated for this purpose. After the selection of the architectural firm for the design of the Crown Point monument, considerable progress had to be made to enable the monument to be completed by July 1912, which was only 17 months away. The architects had to write to the Lighthouse Bureau to get documentation for the lantern and specifications for the existing lighthouse, finish the design of the monument, get it approved by both commissions as well as by the Bureau, decide on the types of granite to use, select a contractor through a bid process, and then select a noted sculptor who could design a fitting statue of Champlain and have it completed for the dedication ceremonies. By March 28, 1911, three drawings for the Crown Point memorial were submitted to the Lighthouse Bureau. The new design added five feet to the height of the lighthouse and this required the approval of the Bureau. The design would place the lantern 50 feet above the ground and 101 feet above the Lake and make the entire structure 73 feet tall. To understand how the lighthouse was built, the Lighthouse Bureau sent the architects the blue prints and contract for inspection. The blueprints dated October 8, 1856 indicated that the foundation extended below the ground by only three feet and that there was no cellar in the keeper’s house. The problem was, there was a cellar and the contours of the site indicated other discrepancies. In order to design the foundation correctly, the architects needed to know if the lighthouse was built on rock or earth. It was proposed that test holes be dug around the old tower by lighthouse keeper Ezra Kelsey. The plan was to use the old foundation and extend it outwards to hold the increased weight of the base and eight Doric columns (about 850 tons). The test holes revealed that charred wood and ash were present about seven or eight feet below the ground, and below this, flat stones were present. The ash was from the French windmill that was burned down in 1759 and the stones were part of its foundation. It was concluded that the lighthouse was built almost exactly on the original French windmill (see January’s description). The plan also called for the removal of the outer limestone shell to expose the brick inner wall but photos of the construction show that this was not done. The building of the Crown Point monument started around September of 1911. A temporary light tower was built adjacent to the tower to ensure that the light was unaffected by the construction (it was originally thought the lantern would be jacked up in place by five feet). A derrick (crane) was erected and the first of the cut stone was about to be shipped. By the end of the month, the foundation was complete. The Rodin Bust “La France"
In November of 1908, two months after the NYS Commissioners decided to make a memorial with a statue of Champlain as the centerpiece, architect Hugh McLellan met with French sculptor Jules Edourd Roine who had just finished making an Abraham Lincoln centennial medal to commemorate the birth of Lincoln (McLellan’s father had been friends with Lincoln while living in Springfield, Illinois, and was now one of the top five collectors of Lincolnonia in the country.) He described his meeting with Roine and his desire to use a French artist for the Champlain statue in a November 23, 1908 letter: “as to the question of the Champlain statue in bronze, we have had the pleasure of lunching today with Monsieur Roine, a sculptor of considerable note and great talents, a Frenchman, some of whose works are exhibited in the Luxembourg Gallery at Paris..... I (Mr. McLellan) met him through a friend [Robert Hewitt Jr.] who had commissioned him to design a medal to commemorate the centennial of Lincoln and, which medal has but just been issued. On the strength of this interview we called up Mr. Pell and had a pleasant talk with him. Mr. Roine would be glad to submit to your commission not only a design for a medal, but also model of the statue of Champlain; both to be done without compensation, simply in the hope that, should work be done, his design would receive consideration. It seemed appropriate that such work be done by a countryman of Champlain.” Several years would pass without a decision on the choice of sculptor. After money for the project was finally appropriated, French Ambassador Jean Adrien Antoine Jules Jusserand started communication with Architect Hugh McLellan in June of 1911 concerning the design and sculptures for the monument. The correspondence continued until well after the celebrations in 1912. 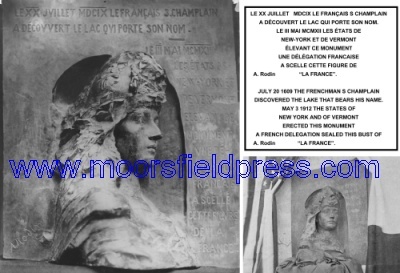 The “La France” bust arrived by ship with a large French delegation on April 26, 1912, at New York harbor. Rodin had chosen to make a replica of his 1904 “Byzantine Empress” bronze sculpture. It showed a likeness of his assistant, Camille Claudel, who is represented in many of Rodin’s other sculptures. For this version, Rodin added an inscription that was dedicated to Samuel de Champlain. See the April description for more information. On July 5, 1912, the Champlain Memorial Lighthouse at Crown Point was to be dedicated. But because of the delay in selecting the sculptor, the three bronze statues would not be completed in time for the dedication. In April of 1913, a year after the completion of the monument, a large storm destroyed the wooden dock and took out the embankment below the steps. Commissioner Walter Witherbee, who lived near Port Henry, traveled to the monument to inspect the damage. It was then that he noticed the oxidation of the Rodin bust. Originally, it was a shiny black color but now it was turning green. On January 3, 1914, Rodin, writing from 77 rue de Varenne in Paris (today the Rodin Museum or “Musée Rodin”), responded to McLellan’s letter and described the process used to make his bust. Most surprisingly is that he proposed to make a second bust that would withstand the severe climate of Crown Point. This was not out of the ordinary as he had made at least two other castings prior to this (1904 & 1906). These castings are found today in England and Scotland (see the April description). Rodin wrote: “Dear Sirs: — I have the honor of informing you that I have received your letter of December 22, which informs me of the unfortunate changes which have taken place in the “patine” which covered, at the time of the inauguration, my bust “La France”. / I am too greatly touched by the kind and complementary sentiments you express not to regret ......................"
When the location for the Crown Point memorial was formally agreed on by the states of New York and Vermont, the New York commissioners decided to build a smaller monument in Plattsburgh. The architectural firm of Dillon, McLellan and Beadel also won the contract to make this monument. The budget for this monument was considerably smaller than the Crown Point monument and the architects had to continually modify their design to come up with the most economical plan. The size of the monument, the choice of sculptor, the number of sculptures (as well as the composition), the type of seawall and even the composition of the stone steps had to be considered carefully. The funding was from the unspent appropriation for the Crown Point monument and was originally set at $17,000 but was later increased to $20,000 with the addition of stone steps and a bronze tablet. If a part of the Crown Point project cost more than expected, it would reduce the amount of money that could be spent on the Plattsburgh monument. In March of 1911, it was contemplated that the sculptor who made the statue for Crown Point could make a replica for the Plattsburgh monument. This was well before the correspondence with French Ambassador Jusserand concerning Rodin’s participation. After the discussions started in June, the selection of a sculptor was delayed, with the approval of the commissioners, until it was known what France would contribute. After the dedication of the Crown Point monument on July 5, all of the commissioners, the NY governor and the French dignitaries (Count de Perette de la Rocca, M. Hanotaux, M. Cormon, and others) traveled on the chartered Ticonderoga to Port Henry and then to Bluff Point and stayed in the newly re-built Hotel Champlain. In 1859, the federal government built a lighthouse on the site of a burned down French windmill. The lighthouse was built by contractors Ellis and O’Neal of Malone, New York, and their contract was dated June 7, 1858. The original lighthouse was octagonal in shape and built of limestone. It contained a circular stair shaft with spiral stone steps which made for a diameter of 16.5 feet at the base and 10 feet 2 inches at the cap. The original tower was 48.5 feet tall to the cap and the lantern was raised an additional 5 feet for the design of the Champlain memorial. A Cape Cod style wooden keeper’s house was built adjacent to the lighthouse. This house is shown in many photographs of the monument. This bust of “La France” was made by world renowned sculptor Auguste Rodin (1840-1917), of Paris, France. He is most famous for his bronze statue of “The Thinker” which is at the Rodin Museum in Paris. The bust on the Crown Point monument is a replica of at least two earlier castings found in different museums today. His 1904 bronze sculpture, “La France”, is in the possession of the Victoria and Albert (V&A) Museum in South Kensington, England. The bust shows the face of Rodin’s pupil, assistant, and mistress, Camille Claudel, and this likeness was based on his work with her done in the late 1880s. The 1904 sculpture had been given the names of “Byzantine Empress”, “Bust of a Young Warrior” and “St. George” (the patron saint of England). After it was given to the V&A museum in 1914, it was renamed “La France”, similar to the name given the Crown Point bust in 1912. A second casting called “St. George (La France)” is owned by the Hunterian Museum and Art Gallery, at the University of Glasgow. In 1906, Rodin gave this bust to the museum when the school awarded him an honorary degree. The main differences between the three busts is that the monument bust has an inscription written in French that commemorates Champlain’s exploration of Lake Champlain. A wooden carving with this inscription is owned by the Hunterian Art Gallery. It was probably used in the casting of this sculpture. January 3, 1914 – In a letter by French sculptor Auguste Rodin, he addresses the concern that his “La France” bust is oxidizing prematurely. He offers to make a second casting which can withstand the harsh environment of Crown Point. January 23, 1912 – The New York Commissioners vote to increase the appropriation for the Plattsburgh monument from $17,000 to $20,000. Money for the granite steps ($1,900) and a bronze plaque ($250) are added. January 23, 1912 – The New York Commissioners vote to increase the appropriation for the Champlain Memorial Lighthouse at Crown Point by $3,100 with the addition of stone steps. The steps are considered an important part of the monument and are shown in many of the photographs. January 30, 1914 – The Treasury Department authorizes the collector of customs in New York City to admit free of duty a second Rodin bust of “La France” to replace the one oxidizing on the Crown Point monument. It does not appear, however, that the second bust was ever made. January 31, 1911 – The House of Representatives passes HR 31600 and authorizes the commissions of New York and Vermont to erect a monument at the lighthouse at Crown Point. January 1912 – Carl Heber is given the sculptor contract for the Crown Point monument for the sum of $9,000. Because of the delay in selecting a sculptor, the three bronze statues (the soldier, Champlain and Indian) will not be placed on the monument until October, four months after the dedication ceremonies. February 7, 1911 – U.S. Representative David Foster’s bill authorizing the construction of a memorial at Crown Point is approved by the House and Senate and quickly signed by the President. February 8, 1911 – The firm of Dillon, McLellan and Beadel is awarded the contract to design the Champlain Memorial Lighthouse at Crown Point. February 26, 1914 - HR Bill No. 11277 is introduced to provide for the construction of a $15,000 to $20,000 granite keeper’s house. Unfortunately, the house is never built. March, 1912 – French Ambassador Jusserand writes to say that Rodin is placing the finishing touches on his bust “La France”. In a few weeks, it will travel to America with a large French delegation. April 22, 1910 – New York Commissioner Walter Witherbee donates the Crown Point reservation to the State of New York. This included all of the ruins and land except for the lighthouse. April 26, 1912 – A large French delegation arrives in New York City on the steamship “France” along with Rodin’s bust of “La France”. April 1913 - Rodin’s “La France” bust is found to be oxidizing. Its color has turned a “lightish green mixed with white”. All images in the 2009 calendar are courtesy the Special Collections, Feinberg Library at Plattsburgh State University College, the Clinton County Historical Association in Plattsburgh, New York or the author. All manuscript material not found in the Tercentenary Final Reports is courtesy the Special Collections, Feinberg Library, Plattsburgh State University College. The Special Collections houses the "McLellan Collection" which contains the original correspondence, blueprints and photographs of architect Hugh McLellan. The Clinton County Historical Association (CCHA) also owns numerous photographs and blueprints of the monuments that had been in the possession of Hugh McLellan. The Special Collections at the Plattsburgh State University College also provided manuscript and photograph material for the 2002 through 2008 calendars. CCHA also provided photographs for the 2008 calendar. This calendar, with a 15 page expanded historical essay on the building of the Crown Point and Plattsburgh memorials, will benefit the Glenwood Cemetery Association of Champlain. The proceeds will be used to restore the Pliny Moore gazebo. It can be purchased at many locations in the Champlain area, Plattsburgh, Elizabethtown and Crown Point.